Early morning drive to Aghios Nicholas to catch the ferryboat to Pessada. Enjoy a one and a half hour boat ride with the local ferryboat and get the chance to see the Dolphins! On arrival in Pessada the coach will continue to the monastery of Aghios Gerasimos, who is also the patron saint of the island. See the cave where he spent six years praying and meditating. Then go on to the Drogarati caves where you will see the most impressive stalactites and stalagmites. The cave is large enough to hold five hundred people and concerts are held there in the summer time because of its natural setting. See also the Royal balcony where the orchestra plays. Maria Callas and Pavarotti have sung there! 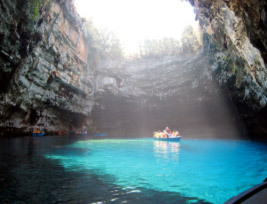 Then on to the nearby Melissani cave and lake.It is said that there was no water in the cave prior to an earthquake, then filled up and giving the cave more beauty as the sun filters in and picks up the colours of the water on the walls. After the boat ride around the cave a chance to shop in the gift shop and then on to Aghia Efimia for lunch and a quick swim. After lunch a photo-stop at Myrtos Bay, the water is a mass of turquoise and an indescribably blue the colour of the water has to be seen, to be believed! Continue along the coastline with its steep cliffs, beautiful shrubbery, and small coves to Argostoli, the capital of the island. On arrival the coach will stop in the main square where you can taste the best ice cream in Kefalonia and have a walk around until its time to leave again for Pessada to catch the ferryboat back to Zakynthos.